UNITED NATIONS, August 30 -- Amid a Security Council split between dueling Syria resolutions introduced by Russia supported by China, versus the Council's four European members and the US, a side fight about which draft first went "into blue," and thus could be called for a vote first, has been joined. Inner City Press asked August's Council president, Indian Ambassador Hardeep Singh Puri on August 30, "Which went into blue first?" He replied that it remains to be seen. Puri's India mission, in asking to hear both sides' arguments, summarized that on August 26 the Russian text was distributed to the Council members in Consultations and Russian Permanent Representative Vitaly Churkin asked for it to be put in blue at 12:50 pm. The Indian summary said that the drafts will only be numbered sequentially after the Security Council takes a final decision on the sequence of the submissions of the requests by Russia and UK. We circulated our draft resolution via the Secretariat during consultations in the Security Council Consultations Room on Tuesday 23 August. It was then the subject of negotiations at expert and PR level. On 26 August at 1259, we sent a written request to the Secretariat asking for the text to be put into blue. At this point, Russia had, neither in writing nor orally, submitted a request to put the text into blue. You state that the “Russian text was distributed to the Council members in Consultations today, and the Russian PR asked for it to be put in blue at 12:50 hours.” In fact, the Russian Permanent Representative did not ask for the Russian draft resolution to be put into blue. He told Council colleagues that he had instructions to put the draft resolution into blue. This did not constitute a request to put the resolution into blue. Rather, it constituted a statement of intention to put the resolution into blue. In short, the Russian Permanent Representative during the informal consultations did not ask the Secretariat that the draft resolution be put into blue. By contrast, and in accordance with usual practice, the UK did ask that the UK/France/US/Portugal/Germany resolution be put into blue, by sending a formal email to the Secretariat asking that it be put into blue. Rule 32 of the Provisional Rules of Procedure provides: “Principal motions and draft resolutions shall have precedence in the order of their submission.” Because our draft resolution was formally submitted first, it clearly has precedence over the Russian draft resolution. The key point now, however, is that the vast majority of the Council agrees that a resolution on Syria is necessary. We should work rapidly on the basis of our text to come up with effective collective action to tackle the deteriorating crisis in Syria. We have arranged negotiations at PR level on Monday 29 August at 1545 for that purpose. After that meeting, on Tuesday morning UK Permanent Representative Mark Lyall Grant told the Press on his way into the Security Council that the UK was first into blue. 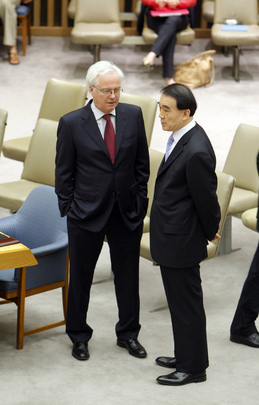 Later on Tuesday, when asked whose was first into blue, Russia's Permanent Representative Vitaly Churkin said, "ours." And President Hardeep Singh Puri said it is still not decided. On the substance, a Chinese diplomat told Inner City Press on Tuesday that, not surprisingly, China supports the Russian draft. With two Permanent Five members, and IBSA too, what could go wrong? Watch this site.